Employee Advocacy is often defined as “the promotion of an organisation by its staff members” but, in reality, it goes a lot further than this with many tangible benefits for an organisation that embeds it into their culture. At Tribal Impact, we believe that Employee Advocacy is about transforming your engaged workforce and creating a credible narrative that’s about so much more than just promotion and sales. It elevates the social reputation of your internal subject matter experts into a position of thought leadership and influence. Adopting a culture of advocacy has been proven to speed up the growth of businesses. 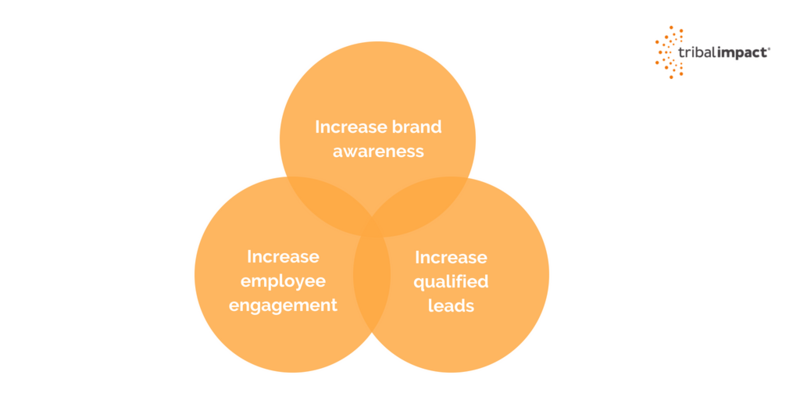 In total, employees have an average of ten times as many social media connections as a standard brand account, which means ten times the sales opportunities. Plus, the McKinsey Global Institute says that productivity improves by 20-25% in organisations with connected employees. Employee Advocacy can also result in a higher proportion of referral-based hires. According to Jobvite these are converted 55% faster, cost less to recruit, are quicker to onboard and stay longer. It also creates a more credible brand: buyers are far more trusting of family and friends (78%) than a company leader (44%), according to the Edelman Trust Barometer. The fact that social media is a ubiquitous part of life means employee voices can be harnessed in a far more effective way. Some 39% of employees have already shared positive comments online about their employer (Weber Shandwick). This is a powerful resource that businesses would be mad to ignore. When you consider the statistics related to employee advocacy, the question of investment changes from ‘why’ to ‘why not’. Employees who practice advocacy are better engaged, more productive and more likely to recommend their business for products and employment. In addition, a good advocacy culture will impact sales, customer retention and brand exposure. There are three strands to the advocacy concept – a low-cost marketing resource with 10x more social media reach than sharing to only company branded channels - and each will individually create a positive return on investment, elevating content and digital marketing outcomes beyond those which can be achieved by a traditional paid marketing strategy. Combined employee social media networks are typically at least ten times larger than those of corporate brands [Source: Cisco]. Leads generated by these networks convert 7x more frequently [Source: IBM] and, better still, user generated content receives 50% more engagement and a 5x greater click-through rate than brand content. The power of online word of mouth to increase brand awareness is clearly demonstrated in this article and, of course, the mutual benefit is there for the employee with around 86% of advocates saying that being involved in social media has positively impacted their career. The simple fact is, today’s consumers don’t want to feel they are being sold to. Traditionally, brands sell and people build relationships. Hence, content posted by a brand will inevitably be shared less than that posted by an individual. Nowadays, 75% of B2B buyers admit to using social media to become more informed about vendors. Although a brand should never force people to post their content, the more employees they can convert to advocates who will be engaged and inspired to share on their behalf, the more success they will have. Authentic Marketing is about putting your employees in front of your logo and enabling them to become the authentic voice of your brand. In addition to doing their own research before engaging with a vendor, some 74% of buyers also admit to choosing the company that first added value to their buying decision. 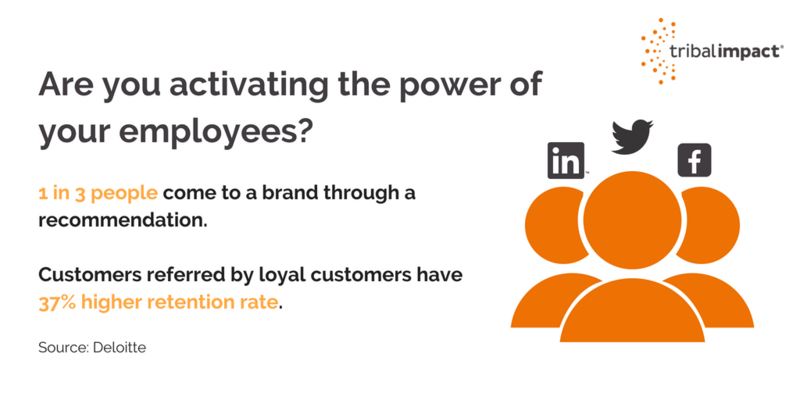 This makes activating the collective voice of your employees an essential element of marketing today. No one brand can keep up with the level of social interaction needed to capture these opportunities. The voice of the employee is powerful and credible. Employee-shared content is viewed as three times more authentic and typically sees a click-through rate that is twice as high as when the corporate mouthpiece shares the same information. [Source: LinkedIn]. But it’s important for brands to recognise that employees aren’t there simply to broadcast their content. Advocacy isn’t about volume of content or interactions; it’s about quality. It’s a case of connecting the dots across your business and putting people online in the context of their roles – and in a way that suits them personally. The consumer is too savvy for any other approach and sycophantic posting and sharing of the ‘corporate line’ will soon be called out. The reticence of employees to take on the role of advocate is most often down to a lack of confidence. With a small amount of guidance, brands can educate their people and guide them in what to post. Let champions lead the way; these will be people who naturally take to sharing and creating content. In doing so, they will inspire others to follow. Probably the most valuable benefit to employees is the opportunity for them to build their own professional brand at the same time as supporting the corporate brand. Being considered an expert is a sought-after status in the age of social media and online networking. Statistics show that socially engaged companies are 58% more likely to attract top talent and 57% more likely to have increased sales leads [LinkedIn Altimeter Study]. Add to this, the fact that B2B buyers are five times more likely to engage with known industry thought leaders and it follows that a social advocate can really impact upon their own targets as well as the corporate results. Find out 5 social media activities to improve employee engagement here. So, how do you convince your leadership team that it’s the right thing to put their employees in front of their logo? Given the continual evolution of social media, it’s no surprise that your c-level executives might need some guidance. 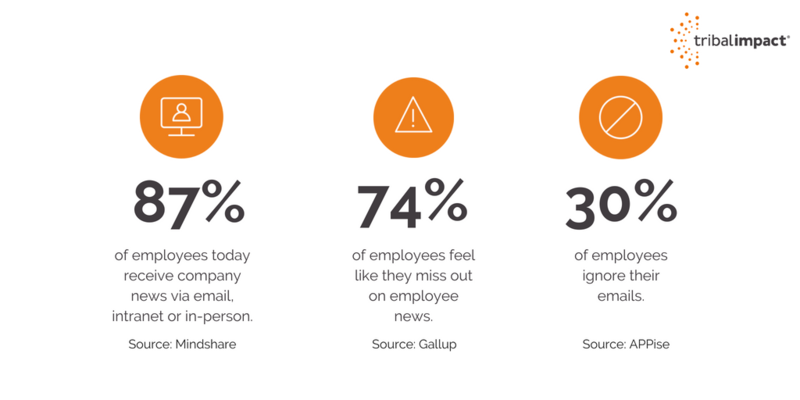 According to Gallup, 74% of employees feel that they’re missing out on company information and news. Further research suggests that only 4 in 10 employees can confidently describe to others what their employer does. This scenario can quickly create disengaged employees and a lack of team spirit. Often, one of the biggest issues when it comes to engagement scores is around manual or remote workers feeling isolated or identifying more with their local team than with the overall brand of the business. Advocacy gives these people the opportunity to get involved. After all, who doesn’t have a smartphone or access to social media these days? Cascading messages has always been a challenge for internal communications teams. Does the message reach people in an undiluted form? Do people understand? According to Google, this issue is huge, with a massive 80% of the global workforce (approx.. 3bn) performing work that doesn’t require a desk on a daily basis. With an employee advocacy app, you can find out what people are reading and share your news on an easy-to-reach platform. By discovering those who will be early-adopters to the idea of brand advocacy, you can kick-start your employee advocacy program and understand where the gaps are between those who are social hero and those who are social zero. Identify where your employees are in their Social Media Maturity journey with our Social Media Impact Quiz. In addition to employee advocacy, internal communication also needs to move with the times. We live in an age where everyone is used to instantly accessing news and information. If we don’t understand something, we ‘google’ it. If we want to know more about something, we use review sites, comparison models and so on to do our research. Clear – high level announcements or confusing financial forecasts need to be tailored to the audience for which they are intended. Inclusive – social media is highly interactive with gamification, discussions, shares and likes being the norm. Internal communication now needs to be smarter than posters and desk-drops in order to capture the enthusiasm of the audience. Varied – by providing different ways to join the discussion, internal communications teams can create the choice and flexibility of external social media usage. This is about producing and sharing content that people feel will contribute to their own online brand. Empowering – internal communications is no longer an area of business where people feel 'out of the loop' of company news. By contributing to the advocacy role of employees, this becomes an integral part of business development and growth. By simply spreading the word, you empower your employees to increase their knowledge and reach their goal of being industry experts. Social selling is fast replacing more traditional methods of engaging a customer. Good content powers social selling and creates expert influence across your audience network. 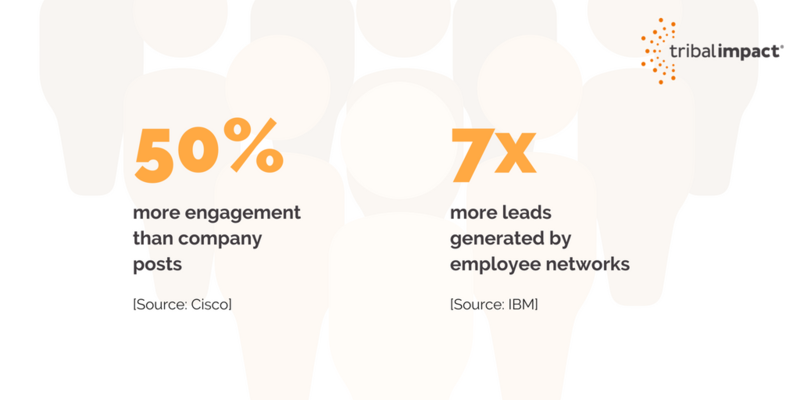 Leads developed via employee’s social activity are seven times more likely to convert and customers referred by advocates have a 37% higher retention rate [Sources: IBM and Deloitte]. Companies who experience a 12% increase in brand advocacy typically generates twice the increase in revenue growth [Source: National Business Research Institute]. It’s the age of the digitally native Millennial and this is changing the way that young up-and-coming talent views an organisation. A massive 88% of major employers say that employee referrals are their number one source of top candidates [Source: Macleod/Clark]. Combine this with the fact that socially engaged companies are 20% more likely to retain top employees and there’s a fairly compelling argument. The majority of employers and recruiters also say that the recruiting process is shorter when candidates are referred and just over 50% say it’s cheaper as well [Source: Job Vite]. Apart from harnessing the single largest asset they have in terms of influencer marketing, inbound businesses drive better conversion on their website, attract higher quality traffic and reduce their paid media spend. Ultimately, a social advocacy program provides real value for money. Despite the fact that only 2-8% of employee social networks currently overlap with brand networks, content shared by employees receives an incredible 8 times more engagement and is shared 24 times more frequently than that which originates with the brand network [Sources: Social Media Today and MSL Group]. The bottom line is that earned media marketing is increasingly seen as a reliable source of growth. Still largely described as ‘free publicity largely from promotional efforts’, earned media will also be attributable to employee advocacy. The presence of the internet and our social media culture is a double-edged sword: on the one hand, it is far easier to get your message out but, on the other, the resulting noise is deafening. Brands and businesses are competing on a 24-hour stage across multiple channels, using a range of different media. The only thing that has a chance of standing out is something refreshingly different. Statistics show that nearly 82% of buyers viewed between five and eight pieces of content from a winning vendor [Source: Demand Gen Report]. This indicates that potential customers aren’t averse to seeing content, but the same report highlights that 65% of buyers feel a vendor’s content has an impact on their final purchase decision. It is clear that the quality and credibility of content is more important than ever. Getting the right amount of good quality, authentic and relevant content out there will ensure an earned media approach cuts through the noise of the old fashioned ways of direct selling. There are many benefits for your employees in building their personal and professional brands by becoming more active on social media. Developing their online professional brand helps them to understand who they are. It also means opportunity can come knocking. And when their network – customers, vendors, press and partners – respond positively, they build confidence and credibility at the same time. By establishing themselves as a go-to person in their industry, they can capitalise on the ability to share knowledge. And that’s a two-way street. They get to showcase and share what they know and they also get increased opportunities to learn and experience other viewpoints on their specialist topics. Whether it’s generating or attracting new inbound leads, creating the best first impression through their rich and varied digital footprint, or becoming a stand-out connection within their organisation, by meeting people and learning more, they will ultimately create a greater Impact in all areas of their life. Scaling advocacy can be difficult if you don't use a tool. Employee Advocacy tools are there to structure branded, and non-branded content, into a centralised platform. Employees can share this content from the platform. Employee Advocacy tools are a great way to help tailor and streamline the content made available to employees for social sharing. It provides peace of mind to both the employee and company that the content is approved. It also provides the company with performance data that can be linked to CRM platforms to track conversion quality. Go check them out. Most will offer a demo. Questions on interface should reflect three areas: flexibility, accessibility and the overall user experience. Consider whether the product is mobile-friendly, available in different languages, has auto-scheduler options and whether it includes any gamification or incentives to promote user engagement. You need to get a full understanding of how charges work: pay per engagement, license-based or flat rate. You should also consider how scaling up works, either for additional employees in the future or even to add partners or customers. In addition, check contract conditions (sign up period, notice period) and, importantly in the face of GDPR, what happens to your data. Is there scope for a pilot? Does the provider offer any support with a communications plan for launch? Does the product include time-saving features such as automated alerts for users; triggers and reminders for registration or re-engagement? How does the administration and permissions process work? What reporting capabilities (including the ability to customize reports) does the product have? What are report frequencies, exporting options and tracking mechanisms? Can you link RSS feeds? Is there AI learning capability (I.e will the product improve with use)? How is content categorised or prioritised? You may need sight of workflows for content approval (especially if you are working in a highly regulated industry). You should also understand the processes for archiving and language filtering. Is there a facility for flagging defined key words in the event that content is posted against policy? What is the data protection policy of the seller? Are there country-specific user agreements? Does the product support integration with other programs such as SSO, CRM and marketing automation. Is training on offer as part of the package? Is there a support SLA and do help desk services exist? Is there centralised or local (in-country) support? Finally, don't forget to ask for a reference customer who you can discuss the product with. So, it’s all signed off. What next? 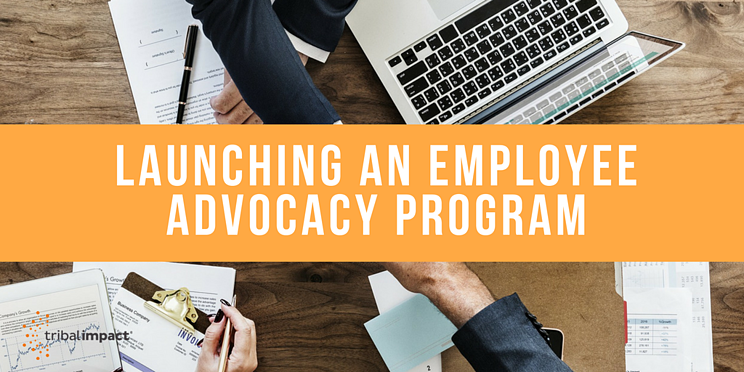 Follow these steps to ensure your employee advocacy program is implemented effectively and fit-for-purpose from the start. You need to consider who you want to reach. Are you doing this to increase brand awareness? Do you want to improve recruitment and candidate talent? Do you want to drive higher conversion on your website? Start by developing your content strategy. Ideally you should have a split of content between third party/industry related content (4 pieces), branded thought leadership such as blogs (1 piece) and branded promotion (1 piece). This, unsurprisingly, is called the 4-1-1 rule. How will the content be categorised? Who will curate and review the content? Content is king. If you get this wrong, not only will employees not bother to share, you may struggle to get them return to your advocacy program in future. In a nutshell, employees won’t share content that’s too difficult – not easy to find a point or a good soundbite to quote; not relevant – too technical or too generic; product focused – too much ‘brand’ content will make them feel like a ‘channel’; not new enough – keep your content supply fresh, otherwise there’s no point in employees returning to check it out. Before you launch your advocacy program, it’s well worth taking the time to understand who your audiences are and the content they might want to consume. Next, finalise the sources of your content. Will you invest in a bespoke employee advocacy tool or will you use an external platform? You can find a list of Employee Advocacy Platforms and their benefits here. Having a tool basically means it is easier for employees to find and share pre-approved content and, as an employer, you get to maintain control over the content and see the resulting analytics. Firstly, in order to help kick-start enthusiasm for your program, identify employees who can help achieve your goals. Perhaps target those already active on social media or who you know will be early adopters of the new culture . You can use Tribal Impact’s Social Impact Quiz to find these existing advocates. Take the time to ensure your people are aware of social media basics, how to use the tool and the sharing etiquette you wish to create (e.g. customising posts, sending the right quantity of posts based on the network being used, understanding the right type of content for each channel etc). Next, create a training framework that best matches the employees’ social media maturity level. Target their training to the right level of understanding and use a format most suitable for them, be that workshops, webinars or eLearning modules. Include training as part of your new starter on-boarding process. Use your existing channels of communication to get things off the ground. Communicate the value you expect to see from the program, for both the company and the employee. Identify a team member to manage your employee advocacy admin. Perhaps create a collaborative group on your Enterprise Social Network (ESN). Do not forget to involve your leadership in the launch. Make sure you reinforce the impact that employees are making, showcase best practices, encourage mobile use and refine your content strategy. Provide continued training for employees ready to move to the next step. You need to maintain engagement levels past the initial novelty factor period. So, you’ve identified your objectives, your launch is complete and your program is finally underway. How’s it going? It’s really important to be taking note of the measurements of success at an early stage. Being agile during the launch phase will enable you to increase your chances of success. Cost per click – check this out for paid social campaigns. Multiply the number of clicks by average cost and you'll get a quick hack for cost saved/value driven via advocacy. Later in the program, perhaps after it’s been running for around six months, you should look at optimising your content and revisit user training requirements to hone your model and maximise success. What patterns are emerging with high performance content? What post types work well: How-to posts? List posts? Is your ratio of brand/non-brand content working? Who is submitting the most content to the platform? Who is submitting the most engaged-with content? Who is submitting the most clicked content? Which categories need more volume? Do you need more thought leadership? Finally, you get to connect advocacy to revenue. It's that moment when Google Analytics is talking to your marketing automation system and your automation platform is connected to your Sales CRM platform. Identify patterns and look for correlations across data. Providing you have the tool stack connected and UTM tracking switched on, you can weave advocacy touched/influenced/generated attribution into your model. In effect, you turn your workforce into a sales force, where potentially everyone can influence the buyer journey. Overall, it’s important to measure the performance of the tool but also to think more widely about how advocacy impacts the business metrics that already exist. For example, consider how employee advocacy is impacting conversion on your website; is the talent you’re attracting through your employer network saving on hiring costs; what is the impact on deepening customer relationships caused by sales keeping their networks informed about the latest innovations. Look beyond the obvious outcomes. Jay Baer, of convinceandconvert.com, sums it up brilliantly. "If your employees aren't your biggest fans, you've got problems WAY bigger than social media". Employee advocacy cannot be forced. If you have unhappy workers the chances are that they're not likely to advocate your brand so you need to work with HR to set the scene initially. Your workforce is not another marketing channel. They are individuals who should be taught how to build their personal brand online by creating best-in-class profiles, sharing content around topics they are passionate about and even creating content such as blog posts. You want employees with social competency not robotic amplifiers for marketing. Employees who advocate the brand can and will support your marketing effort but that should not be the driving force behind the program. Before launching your employee advocacy software tool, take time think about the structure of your content. Divide it up into logical sections most relevant to your internal target audience e.g. make sure the HR folks only see content relevant to them and their networks. If you don't do this, you'll find adoption of the tool will decline over time as the content becomes irrelevant for users. However, there’s a balance to be struck. Be careful not to put people in boxes based on their function. You also need to consider their motivation: are they looking to become a thought-leader or are they focused on their sales performance? Content categories can be set up based on what will engage the employees as well as on what the brand wants to amplify. Some employee advocacy tools allow users to import their own content feeds. By encouraging this approach, you will ensure the creation of a tribe of unique voices; something which is far better, and infinitely more credible, than an orchestrated chorus of parrots. Don't just share branded content with your employees. They will want to protect their personal brand and if they are only publishing branded content it impacts their credibility and authenticity. For example, importing and sharing trending articles that aren't brand related will help develop their online professional brands. As with any social program, there are so many things you can measure. Impressions, likes, comments, shares... the list goes on. Focus beyond some of the vanity metrics: employee advocacy costs money and no business will invest unless they see a return so you need to tie advocacy back to the business. Start with a convincing, high-level fact: high performing firms with a formal employee advocacy program grow faster than those who don’t have one. They also report other benefits, including a shorter sales cycle, improved social selling, better top talent retention and more. The benefits are there to be realised but it’s critical that the right metrics are identified at an early stage. They key to building a compelling business case is to look right across the business. 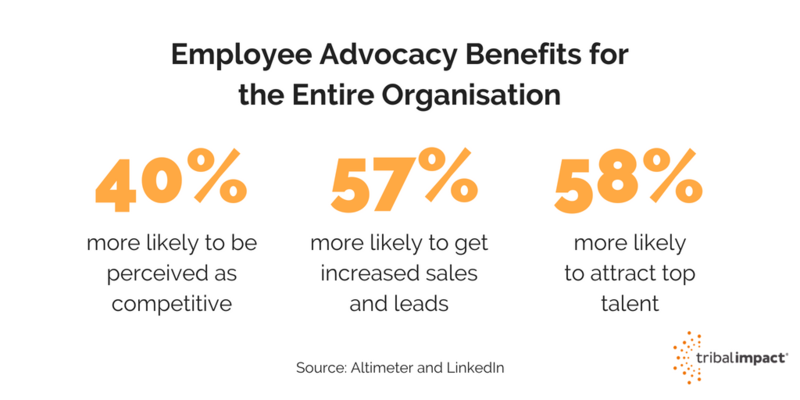 It’s likely that many organisations are focused only on lead generation and conversion without realising that employee advocacy can affect many different departments and processes, which contribute directly to the bottom line. By implementing a successful employee advocacy program, you effectively turn your workforce into a sales force, where potentially everyone can influence the buyer journey. Who are your most active advocates? How frequently are users accessing the tool? Average click to share ratio – are employees sharing content that generates engagement? Overall reach – is employee advocacy increasing organic reach? Brand sentiment – has your NPS score increased since program launch? Are brand social media channels attracting new audiences? Measuring the impact of employee advocacy needs to be considered within the wider context of your business. Look at what your business is already measuring and then seek out correlations and comparisons based on the data you get within your employee advocacy tool. With end-to-end attribution, there is no reason why you can't get to a position where you can confidently say "X number of customers closed as a result of advocacy generating X pipeline". This is possible today if you know how to build the framework to make it happen. exceptional customer service and build positive brand reputation in the marketplace. 3. Increase staff retention by helping staff to develop and build their personal brands. awareness and drive consideration in the marketplace. and influence in the marketplace offline and online.